1. 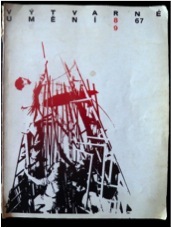 Cover of Výtvarné Uměni, issue 8-9, 1967. 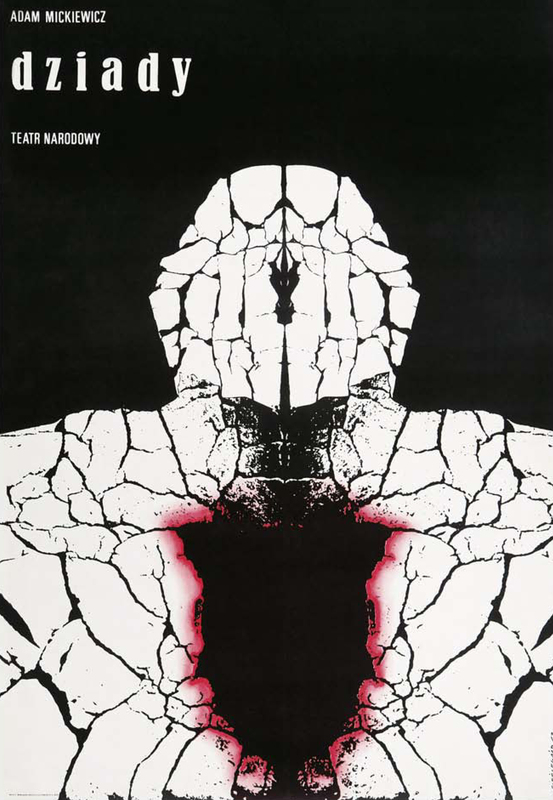 In 1967 Stanislav Kolibal, the Czech artist, was commissioned to design the August-September cover of Výtvarné Uměni (Fine Arts) (fig 1). This was to be a special issue of the periodical, commemorating – like many other magazines and newspapers published in the Eastern Bloc that autumn – the fiftieth anniversary of the October Revolution. He adapted a 1919 photograph of Tatlin at work with two assistants on the timber model of the ‘Monument to the Third International’ (1919-1925). Erasing the background and with the image blending from black to red like a split-colour screenprint, Kolibal turned this historic image into a symbol of unfulfilled aspiration. In a year of booming triumphs (including the opening of the Ostankino Tower, the world’s tallest building serving the world’s largest broadcasting complex, and the massive hydroelectric plant in Bratsk, in south-eastern Siberia), Kolibal’s design seemed to point to incompleteness, perhaps provocatively. Other fantastic visions produced by the Soviet avant-garde have formed different constellations across time and geography. Iakov Chernikov’s machine-inspired architectural schemes were summoned up in the 1960s on both sides of what was once called the Iron Curtain. Peter Cook of the Archigram group in the United Kingdom, for instance, republished the Soviet architect’s works regularly in his books. Chernikov’s 1931 portfolio Construction of Architectural and Machine Forms (Konstruktsiya arkhitecturykh i mashinnyk form) presented stirring images of architecture in movement, as well as a ‘rational’ logic for the design of forms appropriate to the new revolutionary era. Cranes, gantries and rails as well as machine parts, suggested the means by which architecture could escape its static condition. Thirty years later, the same desire for architectural motion was directed by Archigram into its ‘plug-in’ and ‘walking cities’. At the same time in Czechslovakia, Jiři Hrůza argued – perhaps boldly – his 1967 book The Utopian City (Město Utopistů), surveying many speculative projects including those designed by Ivan Leonidov and Chernikov in the 1920s as well as those of his contemporaries such as Karel Honzík, the future could operate as a critique of the present: ‘Just as we can find in the concepts of utopian architectural avant-garde both audacious and prescient anticipations of the future, we can also find escapism from the coarse and prosaic reality of life, an ideal dream formed in disillusionment with the present …‘. Another constellation was formed when the fashion for Deconstruction in architecture emerged in the 1980s: the movement’s champions sought forebears in the Soviet avant-garde. ‘Deconstructivist Architecture’, the landmark 1988 exhibition at the Museum of Modern Art in New York put the largely unbuilt visions of seven European and American architects (Frank Gehry, Daniel Libeskind, Rem Koolhaas, Peter Eisenman, Zaha Hadid, Bernard Tschumi, and the firm Coop Himmelb(l)au) in the company of sketches and drawings by those members of the Soviet avant-garde, Ivan Leonidov, El Lissitzky and Chernikov, whose work seemed to trouble the ‘structural order … of stability, unity and harmony’. 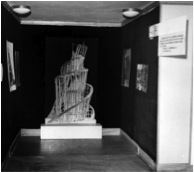 Their designs on paper were adopted as precedents for ‘…provocative architectural design which appears to take structure apart – whether it be the simple breaking of an object or (its) complex dissimulation into a collage of traces.’ However, it seems clear in retrospect that the Soviet avant-garde provided less a model for a radical interrogation of convention than a clutch of techniques for fragmenting and torquing space. In fact, the connection turned out to be just as tenuous as the movement’s engagement with Jacques Derrida’s philosophy from which it borrowed its name. Never constructed, Tatlin’s Tower and Chernikov’s architectural fantasies belong, it seems, to an immaterial and somewhat mythic wing of art and architecture which has been written into history by seizing the imagination of architects, filmmakers and artists, as well as historians and curators, particularly in the West. This engagement with the Soviet past has never been disinterested. Éva Forgács has, for instance, argued that the category of Eastern European modernism was invented by the New Left in the West, charting events like London’s Hayward Gallery exhibition, Art in Revolution, organised with the support of the Soviet Ministry of Culture in 1971, as a kind of hopeful act of wish-fulfilment, particularly after 1968. Such exhibitions sought to reforge the broken link between revolutionary aesthetics and revolutionary politics. Repetition and first time: this is perhaps the question of the event as question of the ghost. What is a ghost? What is the effectivity or the presence of a spectre, that is, of what seems to remain as ineffective, virtual, insubstantial as a simulacrum? Is there there, between the thing itself and its simulacrum, an opposition that holds up? Repetition and first time, but also repetition and last time, since the singularity of any first time makes of it also a last time. Each time it is the event itself, a first time is a last time. Altogether other. Staging for the end of history. Let us call it a hauntology. In what follows, I would like to adapt Derrida’s question – if not his method – to ask: what was the effectivity of the spectres of the Soviet avant-garde in Eastern Europe under communist rule? And, in particular, what kind of ghostly role did they play at its end in Eastern Europe? How was the revolutionary culture which formed at its beginning summoned at its end? Of course, the Soviet imaginary was already full of its own ghosts. After his death in January 1924, Lenin was regularly conjured up by those who claimed to be his successors. The ‘Leninist spirit’ was invoked at every crisis in the Soviet Union and the Eastern Bloc as a kind of energizing, restorative force. After the disaster of Stalinism, for instance, loyal Soviet citizens were encouraged to ‘return to Leninism’ and the policies of Perestroika and Glasnost channelled the Bolshevik leader, at least according to their authors in the Kremlin. Lenin was even issued a subpoena in Prague in 1968 as Warsaw Pact tanks rolled into the city: sardonic graffiti appealed on the city’s walls calling for the Bolshevik leader – ‘Wake up Lenin, Brezhnev’s gone mad.’ Gallows humour to be sure, but idea that Lenin was only sleeping was not, however, an entirely ironic one. When the Bolshevik leader died in 1924, a scheme was hatched by the faithful to ensure that he would be brought back to life one day. Embalming his body was just the first step in a complete programme of rejuvenation: ‘Our duty, our task, consists in bringing back to life all who have died …’. The Bolshevik project sought, as Nina Tumarkin describes, to abolish death. Lenin’s tomb would be the symbol of this great programme of salvation. It was built in the form of three great cubes, following the teachings of Kazimir Malevich: ‘The cube is no longer a geometric body’ he announced. ‘It is a new object with which we try to portray eternity, to create a new set of circumstances, with which we can maintain Lenin’s eternal life’. Malevich was – in turn – a spectral presence in the communist world long after his death in 1935. Artists, writers, architects and poets in Eastern Europe felt compelled to search for and discover the Suprematist artist particularly after Stalinism. Malevich’s art flickered between visibility and obscurity, and myth and experience. It was known but rarely seen. For instance, one of the pioneering scholars of Soviet modernism, Szymon Bojko, a Pole, recalled his visits in the late 1950s and early 1960s to seek out his art – which he knew in reproduction in the avant-garde press in inter-war Poland – but then hidden in the stores of the Russian Museum in Leningrad. His fluent Russian, official invitations from the USSR Fine Arts Association and high-ranking status as a Central Committee member from a fraternal nation did little to improve his chances of seeing these suppressed works, such was the extent of the ‘embarrassment’ and ‘fear’ attached to Malevich’s art. Even though a posthumous injunction was placed on his art, Malevich could still be invoked. During the Zhdanovshchina in Poland, Polish modernist architects Helena and Szymon Syrkus – figures of considerable authority in the pre-war avant-garde – found that their friendship with the Suprematist artist twenty years earlier could be turned into a threatening indictment. Reflecting on their 1947 schemes for the Koło Housing Estate in Warsaw, Jan Minorski, an architect working in the Institute of Urbanism and Architecture, attacked the Syrkuses: ‘These architects often stress that their teacher was Malevich, who stressed the “tension” between solid forms and those of Suprematism. But why refer to a prophet if, in the new reality, the former “master” has nothing to say? This is poor advisor without authority! If Lachert’s work [a modernist architect – DC] is not understandable, how much more so is the work of the Syrkuses. Their forms, one must say, disturb the viewer.’ This was June 1949 but Minorski had already fully absorbed Soviet techniques of character assassination. Helena Syrkus had too: taking the stage at the international gathering of modernist architects, CIAM 7 (Congrès internationaux d’architecture modern), in Bergamo later in the summer of the same year, famously she gave her audience a public demonstration of the Soviet mania for ‘samokrytyka’, a public confession of the ‘errors’ in one’s earlier thinking or actions. She argued that the kind of technological invention and abstract volumes which the CIAM members in the audience were committed, and that she herself had promoted so vigorously until recently, were already outmoded in the age of Soviet progress. Malevich was ‘rehabilitated’ in Poland during the Thaw. The art press – enjoying a new found tolerance of abstract art – reproduced images of his architectons and the ‘Black Square’ (1913) copied from the pages of pre-war avant-garde periodicals. These wan images were animated by memories of the artist’s month-long visit to Warsaw in 1927 from surviving members of the pre-war avant-garde, Henryk Stażewski and Jonasz Stern. And when modernist Polish poet Julian Przyboś curated an exhibition of ‘Précurseurs de l’art abstrait en Pologne’ at the Galerie Denise René in Paris in 1957, he included works by Malevich, a gesture which claimed the artist as Pole (identified as Kazimierz Malewicz) and, more importantly, reconnected Warsaw with the twin capitals of pre-war modernism, Paris and Moscow. As the two works by Malevich which had been given to the Syrkuses after his exhibition in Berlin in 1927 – a suprematist composition on canvas and a maquette of an architecton – were lost (stolen from their studio in the winter of 1945), Przyboś had to borrow two canvases from the Stedelijk Museum in Amsterdam. The Czechoslovak engagement with Malevich runs on parallel tracks, even if the effects of the Thaw were felt there later than in Poland. Artists were drawn to his non-objective world from the late 1950s. In 1959 writer and collage-artist Jiří Kolář created a concrete poem dedicated to the artist, ‘Pocta Kazimíru Malevičovi’ in which, according to Raoul-Jean Moulin ‘a page was torn in a gesture symbolizing the repudiation of the traditional painter.’ Six years later Kolář’s compatriot, composer Rudolf Komorous, created the first piece of electronic music in the country. Entitled ‘Malevich’s Grave’ (Náhrobek Malevičův), the piece eschewed melody, perhaps deriving its long tones and occasional pulses from the artist’s floating geometric masses and lines. 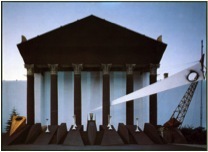 In 1968 artist Stanislav Zippe of the Synteza group used a recording of Komorous’ ‘Malevich’s Grave’ to lend synaesthesic effects to one of his kinetic artworks, ‘Transformation’ (Proměna). Installed in the exhibition hall of the Music Theatre (Divadlo hudby) in Prague, the piece featured four white square surfaces placed on the ground and lit with lamps. A central light overhead changed colour whilst four light sources closer to the squares gained and reduced in brightness. Whilst abstract art remained a matter of considerable controversy in the Soviet Union throughout the 1960s, Dvizhenie operated with official imprimatur, only occasionally falling foul of its patrons in the party-state. The group’s chief ideologue, Lev Nussberg, was a well-connected and skilful operator, adept at persuading the Soviet authorities to support the group’s projects. In the late 1960s, Dvizhenie’s works travelled abroad, first in the Eastern Bloc and then in Western Germany. They were widely reported in the international press too, providing vivid evidence of the creativity of Soviet culture after its apparent ossification during the Stalin years. To find examples where Soviet avant-garde and politics intersect critically we have to look to the late 1960s or, more precisely, the anniversary of the fiftieth anniversary of the October Revolution in the autumn of 1967. This event – as I’ve noted above – was embraced by communist authorities across the Bloc as a way of asserting the authority of the Soviet Union as the leading force in world history. Throughout the 1960s, the impending anniversary formed an important, magnetic point on the horizon. Numerous Soviet achievements in the fields of science, engineering and technology were timed for completion in 1967. The ‘eternal’ figure of Lenin was central to these anniversary events too. A new print of Eisenstein’s film ‘October’ (1927) was reissued with many of the cuts made during the Stalin years restored and a new soundtrack composed by Dmitry Shostakovich (op. 131, ‘October – a symphonic poem in C minor’). The film played an ambassadorial role, travelling around the world. Similarly, Dvizhenie – the group of young artists who had been such keen enthusiasts for Malevich’s art – orchestrated an electric tribute to Lenin in Leningrad (fig 2). Four enormous screens were placed around the monument to the Bolshevik leader outside the Finland Station, the historic site of his return to Russia in 1917. Historic film footage as well as Soviet movies dramatising the revolution were projected onto three screens whilst three beams of colour brought a suggestion of movement to Lenin’s looming silhouette on the fourth. A sound collage of music, poems and Lenin’s speeches filled the air. The festive rediscovery of the ‘spirit of October’ was also stage-managed across the Bloc. Numerous exhibitions were organized and publications issued with official imprimatur. 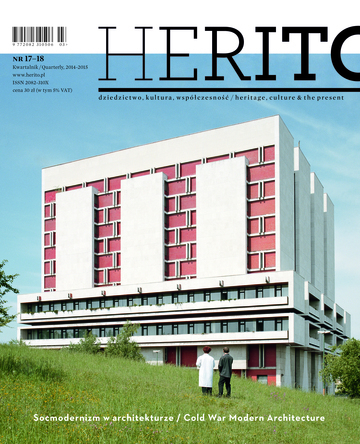 The August and September 1967 issue of Výtvarné Umění – with Kolibal’s cover – was dedicated to the Soviet avant-garde, much of the content drawn from research which had been conducted in Soviet archives and collections by Miroslav Lamač and Jiří Padrta since the early 1960s. It was a remarkably rich visual and textual archive: alongside numerous high quality images of works by Gabo, El Lissitzky and others, it featured translations of historic documents such as extracts of Malevich’s 1919 book On New Systems in Art (O Novykh Sistemakh Visk) and Naum Gabo and Antoine Pevsner’s 1920 ‘Realist Manifesto’ (Realisticheskii manifest). (The only engagement with the Soviet present in this issue was a lengthy section on the Dvizhenie group including a translation of the group’s 1966 manifesto). 3. ‘New Art at the Time of the October Revolution’ exhibition, Współczesna Gallery, Warsaw, November 1967- during installation. In Warsaw, the Współczesna Gallery under director Janusz Bogucki opened a show on 8th November 1967 (the fiftieth anniversary in the Gregorian Calendar) entitled ‘New Art at the Time of the October Revolution’ (‘Nowa sztuka czasów Rewolucji Październikowej’) (fig 3). The interior of the gallery was organised as ‘agit-tram’ to represent the propaganda work of the avant-garde during the Civil War period. The artworks included prints, architectural models, books and magazines, as well as ceramics produced by the Soviet artists, many of which were drawn from the collection of Szymon Bojko. Efsir Shub’s ‘The Fall of the Romanov Dynasty’ (1927) and Sergei Eisenstein’s ‘Strike’ (1925) were screened and pre-war leftist artists, including Futurist poet and gulag-survivor Anatol Stern, were invited to speak in the gallery. Similarly, in Budapest students from the Faculty of Architecture at Budapest Technical University operated a semi-official gallery (i.e., tolerated, meaning uncensored and unfunded) in their student centre at ut. Bercsenyi 28-30. One 1968 show, curated by Tihamér Gyarmathy, an abstract painter whose career began before the Second World War, explored the heritage of the Soviet avant-garde. Copies of works by Malevich, Wassily Kandinsky and Tatlin were put on display. What triggered this anxious reaction on the part of the Polish authorities remains obscure. But the answer may be found in the emergence of the New Left – often student radicals – across the People’s Republics. Critical voices in Czechoslovakia on the eve of the Prague Spring and Hungary were becoming increasingly bold making ‘revolutionary’ demands: famously Milan Kundera, for instance, took to the stage at the Writers Congress in June 1967 demanding freedom of speech and denouncing the ‘degeneration’ of socialism under Soviet rule of Czechoslovakia. In spring 1968 in Hungary, the state rounded up and prosecuted radical socialists – many children of prominent communists – for conspiracy. Their crimes were negligible: inserting leaflets denouncing ‘the red bourgeoisie’ in Hungary and the Soviet Union into library books; and attempting to make contacts with hard-liners in Albania and China (lending the accused the badge of Maoism). Nevertheless, some fifty were put on trial and some imprisoned. 4. Scene from ‘The Agitators’ (Agitatorok), directed by Dezső Magyar, 1969-70. By a curious turn of events, some of the Hungarian radicals in the dock in 1968 stood before the camera in 1969 as actors when the Béla Balázs Studio commissioned director Dezső Magyar to make ‘The Agitators’ (Agitatorok), an experimental feature film marking the fiftieth anniversary of the Hungarian Soviet Republic (fig 4). Magyar and Gábor Bódy adapted Ervin Sinkó’s novel The Optimists (Optimistak) by combining it with other historical and contemporary sources. In the manner of Godard’s film ‘La Chinoise’, the student actors ‘ventriloquise’ the words of György Lukács as well as Mao and Che, and the soundtrack includes music by the Rolling Stones. By folding past and present together, this cinematic portrait of Hungary’s short-lived 1919 commune asked what happened to the ‘spirit of revolution’ in Eastern Europe after the repression of the Prague Spring and Kádárism. Képarchitektúra rejects all schools – including the schooling of ourselves. Képarchitektúra does not confine itself to particular materials and particular means; like Merz-art it regards all kinds of materials and means as useful to express itself. Képarchitektúra does not dabble in psychology. Képarchitektúra does not want anything. The majority of the visitors to the Adolf Fényes Hall in 1967 saw these works for the first time. (‘This’, wrote Kassák, ‘will be the first introduction of constructivism. The gate has opened, and I am walking through it’). This added to his myth as what Forgács has called ‘an anti-authoritarian authority’: a poet, artist and activist, he began his career before the First World War and died in 1967. He was opposed to the bourgeois culture of the Dual Monarchy and antagonistic to György Lukács’s Nyugat progressives; an active figure during the Commune in 1919 who was said to have resisted the instrumentalisation of his art as propaganda; harassed by the Police in Hungary in the 1930s and the new regime which took hold in Hungary in 1949. Paradoxically perhaps, Kassák – the polemical and abrasive writer and artist associated with montage and other fragmented aesthetics – offered some kind of continuity in a broken chain of catastrophes in Hungary in the twentieth century. At the end of his life Kassák was adopted by the emerging neo-avant-garde as the symbol of intellectual independence (despite being awarded the Kossuth Prize). Often it was Kassák’s positions in relation to power which drew his adherents but some were drawn to his art as well. In 1973, for instance, neo-avant-garde artist and film-maker Dóra Maurer printed three issues of Ma, the first of which not only adopted the title but also the layout of Kassák’s avant-garde magazine (1916-1925). The generation of artists and architects who had engaged with Soviet Suprematism and Constructivism after the Thaw did so in order to reflect on the future, perhaps optimistically. Another order of schemes emerged across the Eastern Bloc in the 1970s and 1980s which were concerned with the past. This was evident within the phenomenon of ‘paper architecture’, fantastic schemes designed by architects, often as entries in international competitions. Russian architect Yuri Avvakumov made models which invoked the tribunes and propaganda structures designed by Gustav Klutsis and El Lissitzky at the end of the Soviet Union; whilst his compatriots Dmitry Bush and Dmitry Podyapolsky imagined a mirror structure in the centre of a teaming megalopolis as a white square. Their 1986 drawing carried the evocative and unmistakable title ‘The Cube of Infinity.’ Widely exhibited and published, the schemes were firmly associated with Soviet Russia, with Avvakumov reintroducing the term for the title of an exhibition in Moscow in the offices of a literary magazine, Jonost (Youth), in 1984. But the phenomenon predated its Avvakumov’s act of nomination. Artists and architects associated with the Tallinn School produced an exceptional body of paper architectural schemes through the course of the 1970s which often used the vocabularies of Constructivism and Suprematism somewhat ironically: Leonhard Lapin designed, for instance, an ‘Anti-International Monument. Tower (Stable) For Artist Valdur Ohakas’ Donkey’ in 1974, alluding perhaps to the primitive techniques employed in the construction of the first Soviet monuments. Moreover, the phenomenon of Paper Architecture was spread more widely across the Bloc than is generally recognized: young Czech architects Lukas Velíšek, Martin Suchánek and Michal Šourek, also revisited Tatlin’s Tower in a scheme in the early 1980s which envisaged this symbol of ‘permanent revolution’ as a metaphor for a human life, one which necessarily results in death. Their tower was organized as a kind of instrument for recycling the remains of dead buildings. Perhaps it is easy to read such schemes with the hindsight of history, nevertheless, it seems that these paper projects often took pastness, entropy and breakdown as their themes. 5. Gábor Bachman, Miklós Haraszti, György Konrád and László Rajk, The Striker’s House, entry into the Bulwark of Resistance competition, Japan Architect, 1986. One scheme produced in Hungary in 1985, ‘The Striker’s House’, stands out. Created in response to a competition announced in Japan Architect with superstar architect Tadao Ando as the judge, ‘The Striker’s House’ is an unorthodox axonometric drawing combining photographic elements and dynamic arrangements of lettering (fig 5). The house is an angular structure formed of black and red ‘wedges’ arranged on a structure fashioned from what seem to be industrial materials. Revolving on a locomotive turntable, it is an agit-train wagon as if designed by a latter-day Constructivist. Train tracks radiate in all directions and the railway shed is filled with posts and banners dressed with slogans to motivate the striker. Perhaps these are the tools of the commissar or the activist, ready to travel wherever he or she is needed. ‘The Striker’s House’ was the invention of a remarkable quartet of intellectuals who combined New Left and neo-avant-garde pedigrees. They were artist Gábor Bachman and architect László Rajk, the son of the victim of the first show trial in Hungary in 1949, László Rajk snr. A samizdat publisher and distributor, Rajk designed covers for books published by AB Kiadó (AB Press) – including Tibor Méray’s notes on the trial of Imre Nagy, Why Did They Have to Die? (Miért kellett meghalniuk, 1982) and reports of strikes in Poland, Radom-URSUS 1976 (1983). He also illustrated György Dalos’s 1985, a samizdat extension of Orwell’s dystopian novel, imagining the death of Big Brother and the end of his authoritarian rule. Rajk and Bachman had founded their creative partnership in 1981, designing interiors and film sets, often in a modish neo-constructivist style. In fact, Rajk had been involved in publishing Soviet designs even earlier, lending materials which he had sourced as a student in Canada, for an issue of the semi-official periodical, Bercsényi 28-30, published in 1977 by students of the architecture faculty at the Technical University. In conceiving ‘The Striker’s House’, they were joined by the dissident writers György Konrád and Miklós Haraszti whose books had indicted the communist state for its betrayal of socialism. Haraszti, a former Maoist, for instance, had written Darabbér (which appeared in English as A Worker in a Worker’s State), a book about the exploitative use of piece rates in Hungarian factories in 1973. Circulated as samizdat in just eleven copies, he was arrested and charged with incitement against the state. In jail, he went on hunger strike and had to be force-fed. ‘The Striker’s House’ was a memorial work, commemorating the wave of strikes in Poland in 1979 which had led to the Gdansk Accords between the state and the Solidarity Trade Union. What we discussed with Konrád and Haraszti, and then finally decided on was the idea that the strike is the extreme extreme of peaceful resistance. It is not only peaceful but you put yourself and your family in danger. It is like standing in front of the guns naked. The resistance is your own self-sacrifice. This is what we want to demonstrate with a house which first loses its exterior and finally stands naked. 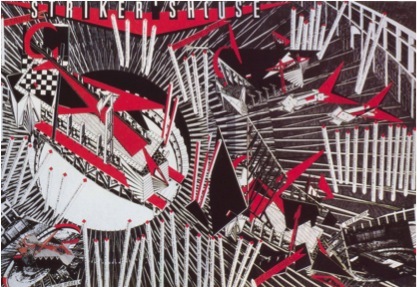 This theme – even though expressed in a coded fashion – was sufficient to make this drawing a threatening object in 1985 (by which time Solidarity had been forced underground). As a result, its authors were only able to send it to Japan with the help of a friendly contact in the American embassy in Budapest. This was, in effect, samizdat architectural design. One reading of ‘The Striker’s House’ scheme is to see it as an ironic object, commemorating anti-Soviet politics in a proto-Soviet style. But its Leftism should not be read as dissimulation. Perhaps this image is evidence both a kind of nostalgia for revolutionary politics, as well a note of envy on the part of these Hungarian writers and artists for the alliance between the workers – expressed here in the leftist iconography of industrial civilization – and the intelligentsia which had given Solidarity such force in Poland. This is something that Konrád and Iván Szelényi had argued for in their Intellectuals on the Road to Class Power, written in the summer of 1973 and published in samizdat. On its pages, we find another expression of the desire of Hungarian intellectuals on the Left to be ‘anti-authoritarian authorities’. ‘The Striker’s House’ was not built: it was paper architecture after all. But, remarkably, it was given material form as the subject of an 1985 film made by Bachman and shot in the industrial ruins of the gas plant near the Óbuda district of the capital. This facility had been closed down in the previous year. Shot illegally on video with Gábor Bódy (an artist, film-director and an actor who had written the screenplay for ‘The Agitators’), the film records ‘The Striker’s Home’ being pushed on rails by a group of men into the decaying factory. Like the demonstrations from the 1920s during which Tatlin’s Tower had been wheeled through the streets of Petrograd, this object of the machine age is moved by human power. The structure is decorated with the slogan ‘Munka és Tett’ (Work and Action), a combination of the title of two journals published by Kassák in the 1910s and 20s. The block lettering makes the connection explicit. One of the figures delivers a speech with a megaphone, accompanied by workers beating and welding. Like a concert of industrial sounds played out in this industrial ruins, Bachman seems to forge a link with then fashionable style of Industrial Music (created by Einsturzende Neubauten and others). Delivered in the hectoring tones of a commissar, this monologue sounds like an absurd manifesto. Philosophic and poetic at the same time, it points to the uselessness of art. ‘The aim of art is to describe what cannot be described … Increasingly decaying into irrationalism … Hunger is not the only reason for our insomnia … It is impossible to fill even only one hour of my existence with that, I want someone to cut my throat with a sharp stone!’ Bachman’s film took its title, ‘The Construction of Nothing’ and commissar’s sloganeering from a text by János Megyik, an émigré Hungarian artist living in Vienna. Absurdity and irrationalism conjoin with these images of ruination to point to the utter exhaustion of utopianism. ‘The Striker’s House’ – in this second iteration – was a symbol of entropy. ‘The Striker’s House’ was a self-conscious attempt to form a loop between the start and the end of the Soviet system. It was after all, an expression of anti-Soviet sentiment by some of its most active opponents. But it did not actually mark the end. That role was, perhaps, played by another design by Bachman and Rajk four years later. In 1989 they were commissioned to design the setting for one of the milestone events at the end of communist rule in Eastern Europe, the reburial of Prime Minister Imre Nagy and the leadership of the 1956 Uprising. Nagy and his colleagues had been executed two years after the suppression of the Uprising, their bodies buried – face down and bound – in unmarked grave. The question of how to remember the Uprising and its victims was one of the tensions between official and dissenting culture in Hungary in the 1980s. In 1988 the state made a concession by establishing a Committee for Historical Justice (Történelmi Igazságtétel Bizottság) which began a process of reassessing the show trials and the cases of those executed after 1956. Within a year the state had ‘agreed to the reburial of those executed on 16 June 1958’, the date of Nagy’s death. That event – which took place in June 1989 – became a milestone in Hungary’s transition to a new, more democratic regime. 6. Gábor Bachman and László Rajk, decorations for the reburial of Imre Nagy and his associates, Műcsarnok Gallery, Budapest, 16 June 1989. The ceremony took place in Heroes’ Square (Hősök tere) in the centre of Budapest. Six coffins – placed different wedge-shaped, angular forms – were organized in ranks in front of the Műcsarnok, a neo-classical art gallery (fig 6). Five contained remains of the leaders of the Uprising, whilst the sixth remained empty to symbolise more than 300 others who were executed. Bachman and Rajk designed symbolic objects which narrated the Hungarian experience of communist rule. The slanted rostrum echoed the propaganda structures designed by Gustav Klutsis and El Lissitzky in the 1920s but now had the appearance of age, seemingly rusty. It supported an angular ‘white wedge’ featuring a burned-out circular form, reminiscent of the Hungarian flags which were stripped of their communist insignia during the 1956 Uprising. These were not the only historical allusions. László Rajk – Rajk’s own father – had been the victim of a show trial in 1949 and had been reburied as a hero during the short Nagy government in October 1956. His catafalque been displayed outside the Kossuth Mausoleum before his remains were buried in the Kerepesi Cemetery. The theatrical treatment of the setting in 1989 had other historical echoes. Dressed in black and white linen for the event, the Műcsarnok overlooks Heroes Square. During the Commune in 1919, the national figures on the Millennium Monument of 1900 (which lend the square its name) were also covered in red fabric and a temporary statue of Karl Marx embracing the workers was erected. For an event marking the end of communist rule, the reburial of the victims of 1956 was suffused with traces of its beginning, namely the Commune. The event was intended by the authorities to be an act of atonement: Bachman and Rajk’s design sought to lay much more to rest. The diverse encounters of Eastern European intellectuals with the Soviet avant-garde never cohered into a orderly body of knowledge or a coherent historical project. Images of abstract art and fantastic architectural schemes were summoned up, often at moments of political tension, because they provided the means to reflect on revolution. Copies or facsimiles of original Soviet works, these were invariably short-lived apparitions. Moreover, the interest was a somewhat specialist taste on the part of some Eastern European intellectuals. This, as I have suggested, was threaded with a latent concern about their own role in relation to power. Here, perhaps, another important difference with the rediscovery of the Soviet avant-garde in the West can be drawn. Constructivism and Suprematism were the subject of considerable market interest in the 1970s and 1980s as well as ‘blockbuster’ exhibitions like the Paris-Moscow 1900-1930’ curated by Pontus Hulton at the Centre Georges Pompidou in Paris in 1979. Only in the final years the communist rule in Eastern Europe was something similar attempted. In 1987 the Műcsarnok Gallery in Budapest (which had lent its entrance to the ceremony for the reburial of Nagy and the other victims of 1956) mounted ‘Art and Revolution: Soviet Art, 1910-1932’ (Muvészet és forradalom: Orosz-Szovjet muvészet, 1910-1932) with the support of the Soviet Ministry of Foreign Affairs. A pioneering and extensive review of the Soviet avant-garde featuring original artworks by Mikhail Larionov, Natalia Goncharova, Malevich, Kandinsky, Tatlin, Rodchenko and others from Soviet collections, the response of the public to the show was muted. Art critic and curator Katalin Keserü recalls an ‘almost ghostly visit paid by János Kádár on New Year’s Day 1987.’ What the secretary of the communist party and prime minister who had been given the reigns of power after the Soviet repression of the Uprising in 1956 thought of the exhibits is not known. ‘Most probably he had expected to see a social realist exhibition’, speculates Keserü, ‘but it is to his credit that he thoroughly examined the entire show, presenting the work of the avant-garde leading forward to that of Stalinism’. Perhaps the Kremlin’s long-serving and loyal retainer was haunted by a sense of what-might-have-been. Svetlana Boym, Architecture of the Off-Modern (New York: Princeton University Press, 2008). Peter Cook, Architecture: action and plan (London: Studio Vista, 1967). See Simon Sadler, Archigram: Architecture without Architecture (Cambridge, MA: MIT Press, 2005). Jiři Hrůza, Město Utopistů (Prague: Československý spisovatel,1967) 163. Éva Forgács, ‘How the New Left Invented East-European Art’ in Centropa, 3:2 (2003) 97-100. Galia Golan, ‪Reform Rule in Czechoslovakia: The Dubček Era, 1968-1969 (‪London: CUP, 1973) 244. Malevich cited in Karen L. Ryan, ‪Stalin in Russian Satire, 1917–1991, (‪Madison, Wis,: University of Wisconsin Press, 2009) 159. Nina Tumarkin, ‪Lenin Lives! : The Lenin Cult in Soviet Russia (Cambridge, MA: ‪Harvard University Press, 1997) 190. See Szymon Bojko, ‘Kazimierz Malewicz – bohater tragiczny?’ in Obieg (May 2009) –www.obieg.pl/teksty/11249 – accessed 2 January 2015. Jan Minorski in O polską architekturę socjalistyczną. Materiały z Krajowej Partyjnej Narady Architektów odbytej w dniu 20-21 VI, 1949 roku w Warszawie (Warsaw: Min. Budownictwa, 1950) 65-6. Helena Syrkus later came to regret her forthright support for the Stalinist regime. See Syrkus in Ogólnopolski Narada Architektów (Warsaw: SARP, 1956) 485. See for instance, the February 1958 issue of Przegląd Artystyczny, which takes the form of a thirty-page calendar of the history of Polish avant-garde art that takes Malevich’s Black Square (1913) as a point of origin and ends with the 1957 exhibition, ‘Précurseurs de l’art abstrait en Pologne’ at the Galerie Denise René in Paris in 1957 which featured the suprematist’s works. On this visit see Andrzej Turowski, M‪alewicz w Warszawie: rekonstrukcje i symulacje (Warsaw: Universitas, 2002). H Syrkus, ‘Kazimierz Malewicz’ in Rocznik Historii Sztuki, v. 1 n. 1 (1976) 153. Kasimir Malevich, The Non-Objective World: The Manifesto of Suprematism (London: Dover Publications, 2003) Reprint of 1959 edition translated from the German by Howard Dearstyne (Chicago, P. Theobald, c. 1959). Lev Nussberg, Manifesto of Russian Kineticists (1966), as translated in Igor Golomshtok and Alexander Glezer, Soviet Art in Exile (New York: Random House, 1977) 164. Nussberg (1964) cited by Vít Havránek, ‘Transient and Dispersed’ in akce slovo pohyb prostor, exh. cat., City Art Gallery (Prague: 1999) 378. With close contacts in Prague Dvizhenie played a key channel for knowledge about the work of Soviet Constructivists in Czechoslovakia. Dušan Konečný, a Russophile art critic, was instrumental in publishing the group’s work in the Czech press as early in 1964 and bringing it to the city for an exhibition in 1965 (a show entitled Moskvské kinetické umĕni (Moscow Kinetic Art) at the Karlové Náměsti Gallery in Prague. Art critics, Jindřich Chalupecký, Miroslav Lamač and Jiří Padrta – each of whom wrote about Malevich – were visitors to Nussberg’s Moscow studio too. For detail on these exchanges, see Vít Havránek, ‘Transient and Dispersed’ in akce slovo pohyb prostor, exh. cat., City Art Gallery (Prague: 1999) 379-82. Dvizhenie were given exhibitions in Galerie Gmurzynska in Cologne in 1973 and Museum Bochum in 1978. They were commissioned by Carl Gutbrot, the director of the Dumont-Schauberg publishing house in Cologne. Their research was published in a book of Malevich’s texts and artwork edited by Hans von Riesen, Suprematismus – Die gegenstandslose Welt (Cologne: Verlag V. DuMont Schauberg, 1962). See http://www.andrei-nakov.org/en/malewicz.html – accessed 2 January 2015. Gyarmathy’s career began in the early 1930s and reached an early peak when his work was shown at the Salon des Réalites Nouvelles in Paris in 1947. During the 1950s went into ‘internal exile’ by refusing to exhibit his work. Susan E. Reid, ‘Design, Stalin and the Thaw’ in Journal of Design History, v. 10, no. 2 (1997) 112. Dorota Jarecka, ‘Janusz Bogucki, polski Szeemann?’ in Karol Sienkiewicz, ed., Odrzucone Dziedzictwo. O sztuce polskiej lat 80 (Warsaw: Muzeum Sztuki Nowoczesnej, 2011) 26. Two weeks later, the National Theatre staged Adam Mickiewicz’s poetic drama ‘Forefather’s Eve’ (Dziady, 1822) in the same building complex. It too was to planned as a fiftieth anniversary event: the play’s references to dull-witted bureaucrats and Tsarist despotism were in tune with Lenin’s attack on Tsarist Russia. 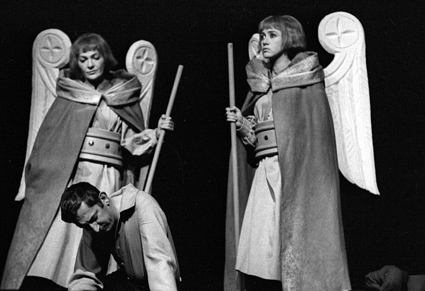 But the Polish audience read the 1967 performance as allegory for the present. They jeered the imperial characters and applauded anti- Russian sentiment. 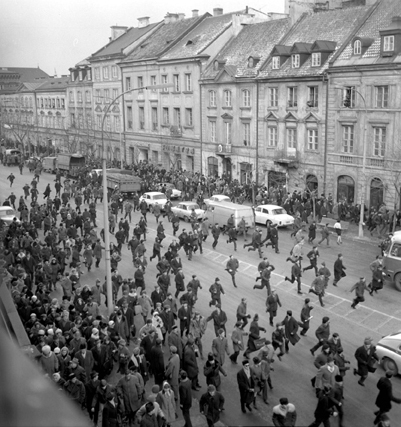 The early closure of the play in late January 1968 – allegedly at the request of the Russian Embassy – was one trigger for a period of public protests and high tension in 1968 that has come to be known as the ‘March events’ (wydarzenia marcowe). See Dušan Hamšík Writers Against Rulers, trans D. Orpington (New York : Vintage Books, 1971) 168. See ‪Robert Gildea, James Mark, Anette Warring, eds., ‪Europe’s 1968: Voices of Revolt (Oxford: ‪Oxford University Press, 2013) passim. By the strange and brutal twists of intellectual history in Eastern Europe, prominent figures who had been conscripted to damn the avant-garde during the Stalinist years now lent their names and, sometimes, their memories to this project of historical disinterment. Pre-war modernist and apologist for Socialist Realism in the 1950s Jiří Kroha published a substantial study (with Jiří Hrůza) entitled Sovětská Architektonická Avantgarda (The Soviet Architectural Avant-garde) (Prague: Odeon, 1973) and Helena Syrkus wrote a vivid and detailed essay recalling her life-long engagement with Malevich – see footnote 18. Lajos Kassák, ‘Képarchitektúra’ (Picture Architecture) in Ma, March 1922, trans. George Cushing in The Hungarian Avant-Garde (exhibition catalogue Hayward Gallery, 1980) 116. Kassák cited by Ferenc Csaplár, ‘From Prohibition to Tolerance, Kassák’s Work and the Cultural Politics of the 1960s’ (2006) available at http://tranzit.org/exhibitionarchive/texts/1135-2/ – accessed 2 January 2015. Éva Forgács, ‘“You Feed Us So that We Can Fight Against You.” Concepts of the Art and State in the Hungarian Avant-Garde’ in Arcadia – International Journal for Literary Studies, vol 41, no. 2 (December 2006) 264. See Deutsches Architektur Museum, Paper Architecture. New Projects from the Soviet Union (New York: Rizzoli, 1990); Alexey Yurakovsky and Sophie Ovenden, Post-Soviet Art and Architecture (London: Academy Editions, 1994). See Andres Kurg and Mari Laanemets’ essays in Keskkonnad, projektid, kontseptsioonid Tallinna kooli arhitektid 1972-1985 (Environment, projects, concepts. Architects of the Tallinn School 1972-1985) (Tallinn: Eesti Arhitektuurimuuseum, 2008). György Dalos, 1985, trans. Stuart Hood and Estella Schmid (London: Pluto, 1983). Miklós Haraszti, A Worker in a Worker’s State trans. Michael Wright (Harmondsworth: Pelican, 1978). László Rajk interview with the author, Budapest, July 2012. György Konrád and Iván Szelényi, Intellectuals on the Road to Class Power, trans. Andrew Arato and Richard E. Allen (Brighton: Harvester Press, 1979). János Megyik, ‘A semmi konstrukciója’ Magyar Műhely 43-44 (1974), 33-39. In his book La voix au cinéma (The Voice in Cinema), Michel Chion coined the word ‘acousmêtre’ to describe a character that can be heard but not seen on screen. Rather than nail down his term with a comprehensive definition, Chion introduces his readers to various kinds of disembodied voices in the cinema. 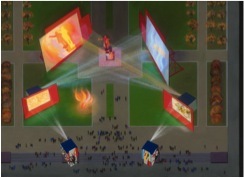 They include the ‘complete acousmêtre, the one who is not-yet seen, but who remains liable to appear in the visual field at any Moment’; the ‘already visualized acousmêtre’ – like a character who becomes a temporary narrator to explain an on-screen flashback; and, perhaps its most familiar kind, the ‘commentator-acousmêtre’, the disengaged speaker who provides a voice over, ‘but never shows himself [and] who has no personal stake in the image.’ The acousmêtre seems to derive special powers by eschewing visibility: these are ‘the ability to be everywhere, to see all, to know all, and to have complete power. In other words: ubiquity, panopticism, omniscience, and omnipotence.’ When acousmêtre acquires a body, it seems to lose authority, even if – as in the case of the Wizard of Oz in the 1939 Hollywood movie – this power was never more than a matter of faith of others. Disembodied, the acousmêtre cannot occupy a clearly demarcated place. Chion writes that it ‘must, even if only slightly, have one foot in the image, in the space of the film; he must haunt the borderlands that are neither the interior of the filmic stage nor the proscenium,’ thereby bringing about ‘disequilibrium and tension.’ Alfred Hitchcock’s ‘Psycho’ (1960) provides Chion with numerous examples of how the uncanny, haunting qualities of the acousmêtre can be summoned to produce dramatic effects. Norman Bates’ mother is foremost an off-screen voice, whilst her body is little more than a evanescent shadow flickering in and out of sight. When, at the end of the movie, and after a police psychiatrist has diagnosed Bates’ condition, we see Norman sitting in a holding cell, it is his invisible mother who speaks. ‘When we hear the voice over Norman’s face,’ writes Chion, ‘his mouth is closed, as if to suggest possession by spirits or ventriloquism.’ This, according to Chion, is the ‘triumph of the acousmêtre’. Audiences watching Hitchcock’s film in the People’s Republic of Poland, when it was first screened on television there in 1980, heard a second, unique acousmatic voice, that of a translator. A single voice delivered the words of all the characters on screen. Both the actors and translator were audible, although the Polish voice was louder and followed a second or less later. The acousmatic voice of Norman’s mother which seemed to have buried itself in his body was now, almost certainly, voiced by a man. Hitchcock’s trashy Freudianism was undone by this act of gender reassignment. Audiences in the Poland – like those in the People’s Republic of Bulgaria and the Soviet Union (where ‘Psycho’ was not shown) – were developing viewing habits which still shape the ways in which people like to watch foreign films and broadcasts today. The practices of subtitling and synchronised dubbing by using a cast of voice actors which dominate film translation elsewhere in the world were too costly. Instead, a single – or sometimes multiple – voice over translation was imposed over the original soundtrack of imported films and other foreign footage. In Russia this technique is known by various names including ‘perevod Gavrilova’ (‘Gavrilov Translation’ after one of the technique’s practitioners). The Poles call the voice over translator a Szeptanka (‘Whisperer’) or a Lektor Filmowy (‘Film Reader’). Preferred by television broadcasters, voice over translation is largely scripted, recorded and added in post-production today but its origins in Eastern Europe can be traced to live acts of translation in the cinema, first of ‘trophy films’ which had been looted from Germany at the end of the Second World War (including prints of movies by the Allies) and, then, of a handful of imported films were which were shown under license in the Eastern Bloc from the late 1950s on. The appearance of films made in the West might be taken as a sign of the political ‘Thaw’, particularly in relatively liberal Poland – the Film Repertoire Council [Filmowa Rada Repertuarowa] established there in 1957 set out to achieve a tactical even balance of films from the two Cold War blocs. Nevertheless, Soviet film censors remained wary of the influence of Western films on local audiences, cutting politically ‘incorrect’ scenes and censoring images of drug use and sexuality. In the Soviet Union occasional film festivals and a few specialist cinemas were rare places were audiences could see international films which had not been approved for wide distribution. The Illusion cinema – which opened in Moscow in 1966 – was one such place. It was the official theatre of Gosfilmofond, the State Film Archive, and a key venue for the Moscow International Film Festival. Early screenings there included ‘Gone with the Wind’ (1939), the Japanese art house classic ‘The Naked Island‘ (1960) directed by Kaneto Shindō, and the 1963 Oscar-winning Italian comedy ‘Yesterday, Today and Tomorrow’ starring Sophia Loren. To support its international programme, the Illusion cinema trained and employed a cadre of professional translators who operated from a special booth equipped with microphones and headphones, as well as lecturers who introduced the repertoire to the public. And when prints were sent to film festivals in the Soviet republics they would often be accompanied by a professional translator from the Illusion cinema. Whilst Razlogova’s interviewees emphasise character and even artistry as valuable qualities, the ideal, as Libergal stresses, was for the translator to be ‘out of mind’. Henryk Pijanowski, a veteran ‘lektor’ in Poland, suggests that the words should disappear too: ‘Mastery of film translation is when the lektor strives to read so that the listener does not hear a thing’. According to this doxa, the lektor’s voice seeks to bury itself in the mind of the listener, to become like thought. All on-screen words – whether titles, close ups of text, dialogue, voice over narration, or on-screen addresses to the viewer – are his. Moreover, they are unified by tone, colour and timbre. Intonation is to be steady and consistent, even when the original on-screen dialogue is delivered at a high emotional pitch; fast paced exchanges are compressed by judicious editing by the lektor; and those points where speech breaks down – like screams and moans – are left alone, as is singing (though lyrics are often relayed in monotone). This professional voice is never embarrassed by what appears on screen, or doubts the action. Nor does it listen to itself. Voice over translation would seem to be akin to the better known and more widespread practice of dubbing or what is sometimes called ‘voice replacement’. But the practices differ in crucial ways. In dubbing, for instance, the aim of the vocal actor is to present the illusion of synchronized speech by overlaying his or her voice over that of another. Gender and age should match, as should the sound with the movement of lips (at least in countries like Germany where the imperative to sync sound with image overrides the requirement of fidelity to the script). By contrast, a lektor uses delay to distinguish his voice from those of the actors on screen: his words follow theirs. The popularity of voice over translation in Poland may well be a product of the the poor reputation of dubbing, particularly in the 1950s when it was still the dominant way of translating foreign films. In 1955 Film magazine gathered the opinions of Polish viewers of René Clair’s ‘Les Belles De Nuit’ (Beauties of the Night, France, 1952) and Slátan Dudow’s ‘Stärker als die Nacht’ (Stronger than the Night, East Germany, 1954): ‘The dubbing in “Stronger than the Night”,’ according to one, ‘was primitive, and completely embarrasses the filmmakers with errors and awkwardness. The actors on the screen open their mouths, and there is silence. This lasts for a while until we hear a Polish voice … the same effect is also found in the scene depicting a clandestine meeting by the river when the mouths of those gathered is met by annoying silence on the screen – like a silent film.’ Even when the dubbing was well-synchronised, other cavils were raised. ‘I cannot accept the convention that the Frenchman on screen speaks Polish. This is something unnatural …’ remarked one viewer of the Clair film. Unnaturalness is a familiar complaint in the history of sound dubbing (Antonin Artaud characterised dubbing as a form of possession and Jorge Luis Borges said that it produces monsters). But the erasure of foreignness might well have been unwelcome too. Unlike dubbing (but like subtitling), voice over translation allows for foreign words and accents to be audible, and, as such, for difference to persist. During the Cold War, the gap between the original voice and its translation was also the gap between East and West or, for that matter, between East and East. In hearing Gérard Philipe or Gina Lollobrigida’s voices in ‘Les Belles De Nuit’, audiences were able to enjoy a little of the internationalism which the Soviet Bloc proclaimed so loudly in its propaganda but denied its citizens in life. Whether this was a wish for solidarity with working classes around the world or a desire to satisfy what Czesław Miłosz once called the ‘hunger for strangeness’ in the grey world of state socialism is hard to know. Another difference between dubbing and voice over narration is the fact that the lektor assumes responsibility for delivering all words heard or seen on screen. To contain this proliferating polyphony, the ‘best’ voice over is transparent, unobtrusive, lacking corporality. This tendency was amplified when voice over translation was imported into the expanding field of television broadcasting in Eastern Europe in the 1970s. Post-sync recording means that the infelicities of live translation are ironed out. Close-micing, producing a very ‘dry’ sound with little reverberation, erases all traces the space of the studio. Offering clear definition, close-micing also lifts the voice out of the space of the film. So close, this voice seems to be inside the ear. It is always there, always on, even, it seems, when the lektor is not speaking. Almost always male, transmitted over the airwaves, and having the capacity to speak for all and to translate every language, the voice of lektor might seem to have the powers that Chion ascribes to the acousmêtre. But, unlike the narrator of movies, newsreels or documentaries, the lektor does not provide expert explanations of events, or insight into the inner thoughts of the characters on screen. He has no capacity for reflection or hindsight. His is, seemingly, an automatic voice, only triggered by the words of others. Rather than being the voice of God, the lektor is a servant of the speaker. His humble status is perhaps revealed by the ‘first’ voice over translator in the Soviet world, Ivan Bolshakov, chairman of the Committee on Cinematography of the USSR. In the 1940s Bolshakov would arrange daily private screenings for the generalissimo in his private cinema. These were both moments of private entertainment and, at the same time, a meeting of the most important film censorship board in the USSR. Stalin’s displeasure would mean that a film would not be acquired for distribution. According to eyewitnesses, he was a particularly active viewer, delivering a running report of the ideological merits and failings of each film – a dictator’s commentary. He had a taste for cowboy movies as well as the films of Spencer Tracy and Clark Gable but according to Nikita Khrushchev, would also ‘curse them, giving them an ideological evaluation.’ A canny retainer, Bolshakov would usually arrange for a choice of films to be available at each screening to improve Stalin’s mood. This introduced a new problem – the prints of the films were not subtitled and so Bolshakov had to be ready to give his mercurial master an extempore translation of the dialogue on the spot. Speaking only faltering English, Bolshakov would prepare by spending hours with interpreters learning the story and lines. Even then, he struggled to keep up with the plot and dialogue of the many films he’d put at Stalin’s command. Stalin apparently enjoyed the deep discomfort felt by his subaltern. Such anecdotes are often relayed by Stalin’s biographers to illustrate his volatile and malevolent character: nevertheless, Bolshakov was a wily operator, successfully extending his role to become the first Minister of Cinematography in 1946. Everything was done using two VCRs, sitting on your knees, basically. One of them had to be stereo. You stuck the original [VHS cassette] into one VCR, a blank VHS cassette into the other VCR, and a mic into this other VCR, too. I translated simultaneously, and my voice was recorded by the second VCR. Then some techie – I’m strictly not technically‐minded – made a master tape of my voiceover. From that point on, it was ‘Full speed ahead!’ – multiple copies were made, and the voiceover hit the popular masses. Often idiosyncratic, these translations departed from the script in ways that appeal to both their viewers and to scholars of translation. One, Alexander Burak, stresses the fact that such translations were made without a great deal of preparation: often long passages of slang or idiomatic phrases would elude the translator and so he would have to improvise (an unintended echo of Bolshakov’s performances for Stalin). Even skilled translators might well enhance the original with local colloquialisms and vivid profanities in an effort to capture what they believed to be the colour of the original. The creative translator of Martin Scorsese’s ‘Mean Streets’ (1973) replaced New York’s street slang with that of Warsaw’s Praga district in a pirate version on sale in Poland in early 1990s. Widely acclaimed as the master of the genre in Russia, Dmitry Puckhov (aka Goblin), who acquired his English in the 1980s on a two-year course at the Dzerzhinsky Police House of Culture and by translating rock lyrics at home, achieved success and some degree of notoriety for his voice over translations which far exceed the principle of fidelity. In rescripting imported thrillers and crime films such as ‘Pulp Fiction’ (1994), Puckhov incorporated the full force of Russian expletives as well as an urgent, highly distinctive tone of voice. These devices, he claims, capture the gritty qualities of the original films far more effectively than pious, literary-minded culture approach to translation promoted by the film studios. His reputation, however, owes more to to his comic voice over translations of the first two ‘Lord of the Rings’ films made in the early 2000s which relocate Middle-earth to contemporary Russia. The principal characters were given comic Russified names: Frodo Baggins became Fedor Mikhailovich Sumkin (a derivative of the Russian word sumka, or bag); the Ranger, Aragorn, was renamed Agronom (farm worker); Legolas became Logovaz, after the Russian car company responsible for Ladas. Puckhov also introduced new elements into the soundscape: courtly dancing at Bilbo Baggins’ birthday party, for instance, is accompanied by a well-known techno track by Ruki Vverh! (Hands Up!). Woven through the voice over narration are what remain topical themes relating to the rampant advance of capitalism in the country. The search story becomes something like a crime drama set in the Russian underworld. The tone is set from the outset when the main character, just returned to Middle-earth after years of wandering, announces: ‘The world is not much changed – people steal as before. MacDonald’s have cropped up everywhere – it is funny I don’t see them here.’ In effect, Puckhov’s versions of ‘Lord of the Rings’ are social satires which function as what Abé Mark Nornes calls ‘abusive translations’ – acts of rescripting which ‘tamper with language usage and freely ignore or change much of the source text’. What Nornes calls ‘abuse’ has the positive value when it ‘helps inject a palpable sense of the foreign.’ Freely available for download, Russian viewers would play Puckhov’s translations over imported films. As Vlad Strukov notes, ‘the sound of the original Hollywood movie becomes secondary as the movie is now meant to accompany the “translation” and not the other way around, as one would expect’. Deeply engrained listening habits mean that voice over translation continues to be the way in which Poles and Russians prefer to watch broadcasts of foreign material (though subtitling is on the rise in cinemas). As K.I. Donnelly notes, ‘it is conventional and thus naturalistic in its own way.’ But the attachment to the phenomenon runs deeper than that. In Poland and Russia today, considerable nostalgia attaches to the early translators of these black market releases (and in marked contradistinction to the characterization of voice over narration by Polish film critics in the early 1990s as an unwelcome hangover from the Soviet Bloc). The extent of the audiences for these illegally-traded copies was so great that their voices are still well known, instantly and comfortingly familiar. Figures who would once needed to mask their activities with anonymity have become minor celebrities. Of Władysław Frączak, for instance, one on-line fan in Poland wrote in 2011 ‘This lektor stood out when I watched my first American film on VHS – ‘Mask’ with Jim Carrey. I can listen to him even when the film is hopeless’. This listener was drawn to Frączak’s idiolect. That the voice over technique is known in Russia by the name of one of its chief practitioners, Andrei Gavrilov who began his work in the 1980s moonlighting from his work as a journalist in the European section of TASS news agency is itself evidence of recognition. Many now work in the mainstream media today. In recent years, the best-known in Russia, Puckhov, has developed a career as an on-line political commentator. (His ‘Goblin News’ sometimes accompanied, by a neat table-turn, with English subtitles). Increasingly visible and often valued for the vocal idiosyncrasies that they brought to the act of translation, these once-acousmatic voices have now acquired names and visibility. Being visible and credited as the owner of a voice is a benefit of post-communism: it chimes with the principles of the freedom of speech, accountability and ownership which have been claimed as rights by opponents of the Soviet Bloc. Bylines are an aspect of professionalization too. Others include the representation by agents and the construction of commercial ‘voice banks’. Lektors in Poland now ply their trade as ‘voice over artists’ for advertising and radio. And when they provide voice over translations, they usually read scripts translated by others. Professional codes and standards – like those articulated by Libergal and Pijanowski above – have been set down. Expansion of the profession has also provided opportunities for a small number of women. But what, one might wonder, has been lost in these developments? Chion – the chief celebrant of the voice in the cinema – calls the process by which the acousmêtre acquires a body ‘de-acousmatization’. ‘Embodying the voice,’ he writes of fantasy, thriller, and gangster movies which feature powerful shadowy kingpins, ‘is a sort of symbolic act, dooming the acousmêtre to the fate of ordinary mortals. De-acousmatization roots the acousmêtre to a place and says, “here is your body, you’ll be there, and not elsewhere”.’ Brought down to earth, the acousmêtre is deprived of its off-screen panopticism and omnipotence. The voice of the Lektor in Eastern Europe has however never occupied this all-knowing, all-seeing realm. Instead, it spoke from the shadows, always echoing another, more authoritative voice. The gap between these two voices was the space in which sometimes fretful, occasionally improvised, and, at times, ‘abusive’ translations could be heard. Michel Chion, The Voice in Cinema (New York: Columbia University Press, 1999) 21. Translated by Claudia Gorbman. Marek Haltoff, Polish National Cinema (Oxford & New York: Berghahn, 2002), 78. Grigory Libergal cited by Elena Razlogova in ‘Listening to the Inaudible Foreign. Simultaneous Translators and Soviet Experience of Foreign Cinema’ in ‪Lilya Kaganovsky, ‪Masha Salazkina, eds., Sound, Speech, Music in Soviet and Post-Soviet Cinema (Bloomington, IN: ‪Indiana University Press, ‪2014) 169. Razlogova’s translation. Henryk Pijanowski interviewed in ‘Zawód Lektor (Lektorzy Magia Polskiego Głosu)’, a television programme made by Michał Jeczeń for TVP1, 2006. On national differences in the approach to dubbing see K. I. Donnelly, Occult Aesthetics. Synchronization in Sound Film (Oxford: Oxford University Press, 2014). Cited in Czesław Michałski, ‘O dubbing dobrze i źle’ in Film, 50 (1955) 3. See Michal Yampolsky. ‘Voice Devoured: Artaud and Borges on Dubbing’ in October, 64 (Spring 1993) 57-77. Czesław Miłosz, The Captive Mind (Harmondsworth: Penguin, 1980) 69. See Grigory Mariamov, Kremlevskii tsenzor. Stalin smotrit kino (The Kremlin Censor. Stalin Watches the Cinema (Moscow: Kinotsentr, 1992). Memoirs of Nikita Khrushchev: Volume 2: Reformer, 1945-1964, edited by Sergei Khrushchev (Philadelphia, PA: Penn State University Press, 2006) 115. Volodarskii cited by Alexander Burak, ‘Some Like it Hot – Goblin‐Style: “Ozhivliazh” in Russian Film Translations’ in Russian Language Journal, v. 61 (2011) 7. Burak’s translation. See Carl Shreck, ‘Goblin Makes the Case against Demonizing Expletives’ in St. Petersburg Times (29 July 2003) 1-2. Natalia Rulyova, ‘Piracy and Narrative Games: Dmitry Puchkov’s Translations of “The Lord of the Rings”’ in The Slavic and East European Journal, vol. 49, no. 4 (Winter 2005), pp. 625-638. Abé Mark Nornes, Cinema Babel. Translating Global Cinema (Minneapolis, MN: University of Minnesota Press, 1997) 179. Vlad Strukov, ‘Translated by Goblin: Global Challenge and Local Response in Brian James Baer, John Benjamin, eds., ‘Post-Soviet Translations of Hollywood Films’ in Contexts, Subtexts and Pretexts: Literary Translation in Eastern Europe and Russia (Amsterdam: John Benjamins Publishing, 2011) 242. When Lucjan Szołajski died in Warsaw in June 2013, numerous obituaries recorded the fact that he had provided voice over translation for more than 20,000 films and television series over forty years.